Morrowind-in-Skyrim remake mod Skywind is continuing its long "look don't touch" trailer campaign. Previously we've seen such exotic locations as Bitter Coast and West Gash, and also had 13 minutes of general gadding about. Now? 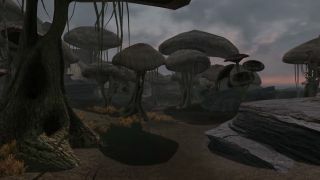 Sheogorad: home of dirt, rocks and mushroom trees. Sure, it's a little bit drab this time—but that's just the region. In fact, Skywind's creators have made a bunch of new assets for Sheogorad's various surfaces in order to make it stand out from the land's other regions. Skywind is likely one of the biggest, most ambitious Skyrim mod projects around at the moment—alongside Enderal. Here's hoping we'll get to do more than just look before the year is out.